25 NW Minnesota Ave., Ste. 1, 541-633-7590, www.alledarealestate.com. Local Bend artist Margi Legowik has created a suite of work she calls Tuscan Spring which is the result of a month in Italy and Spain this year. Franklin Crossing celebrates First Friday with the COCC Fine Arts Faculty. Bill Hoppe, professor of drawing and painting and director of the Pinckney Gallery at COCC arranged the exhibition. Participating faculty members include Natasha Bacca, instructor of digital photography; Paul Alan Bennett, instructor of watercolor and design; Paula Bullwinkel, instructor of design and darkroom photography; Moe Carolin-Anderson, instructor of ceramics; Patricia Clark, instructor of printmaking and drawing; Bill Cravis, assistant professor of 3D design and sculpture; Karen Ellis, adjunct instructor of design, drawing and art 101; Dawn Emerson, instructor of drawing; Avlis Lumas, instructor of massage therapy, guest faculty artist; Peter Meyer, adjunct instructor of ceramic and Margaret Rattle, instructor of ceramics. Cravis will exhibit an 11-foot high installation of Escalator Man, specially constructed in segments to occupy the Franklin Crossing escalator. Noi Thai serves wine and appetizers and the Cascade Chorale of COCC performs do-wop jazz sounds. C3 Events also presents fashion shows at 5:45, 6:30 and 7:15pm of designers of recycled clothing and fabric as featured in the downtown Fall Fest of Art Hop weekend. Billye Turner, art consultant, 541.382.9398, organizes Franklin Crossing exhibitions. 389 SW Scalehouse Ct., Ste. 120, 541-330-8759, www.atelier6000.com. Help us build Atelier 6000 one 2X4 at a time. The 2×4 and Miniture exhibit lasts through October; join us at the close of the exhibition for a silent auction and costume/halloween party on October 27. Dress in costume, or come as you are! Prizes for the best costumes and masks. Wine, beer tasting and a lot of auction fun! 910 Harriman St., Ste. 100, 541-617-8854. Larissa Stafford, featured bead artist. 550 NW Franklin Ave., Ste. 108, 541-323-2779. Featuring Bend traveling photographer Sandra Steele Kunz. With brilliant colors, moving work and grace, every photograph is an experience in realism; none of Sandy’s pictures are posed. Spontaneous, they reveal beauty from around the world. On Bond in Franklin Crossing Building (corner of Franklin and Bond), 541-330-2100. Featuring Birds & Bees, a display of avian and apian mixed media art by Bend artists Tara Doherty and Lloyd McMullen. Tara, (the bug woman), obsessively explores things of metamorphosis thru her painting of colorful and precocious insects. Lloyd uses recycled and found objects to create two and three dimensional narrative paintings. Brenda Reid Irwin, artist, be showing through the end of October and for First Friday. 710 NW Wall St., 541-388-5505, www.bendoregon.gov/abc. City Hall new exhibit Reflections on Mirror Pond – Past, Present, Future. Nine artists were selected for display in City Hall’s first floor corridor for six months. 924 NW Brooks St., 541-678-5162. BendFilm window display contest, featuring artist Sara Carson from Blue Daffodil. 875 NW Brooks St., 541-728-0066, www.facebook.com/CrowsFeetCommons. 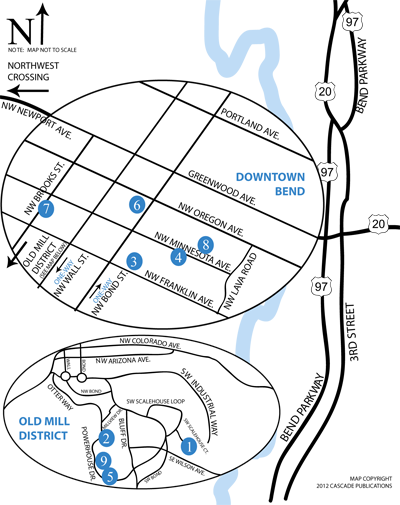 A not-so-forgotten but recently rejuvenated part of “old town” Bend’s rich history. Jubelale artist, Avlis Leumas, will be signing posters and there will be live music out back. Featuring Bend artist Barbara Slater who is inspired by the “out west” way of life and cowboy culture with a touch of city glitz. Painting oils with energy and spirit, this artist’s pigmentation is rich and succulent, while her brushwork is bold and responsive. 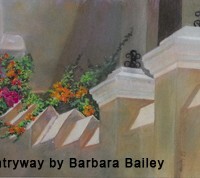 Barbara continues her studies with different genres, painting still-lifes, florals, landscapes and animals. Animals are her present focus with images of vibrant roosters, horses, cows and other barnyard residents. Painting these rural inhabitants with love and respect, Barbara gives each animal an attitude and personality. Slater is a member of Oil Painters of America, California Art Club, American Women Artists (AWA) and The High Desert Art League. www.barbaraslater.com. 37 NW Greenwood, 541-382-2725, www.drycanyonforge.com. Open First Friday, 6-10pm. Studio features contemporary iron work using traditional forged and joined metals. There will be blacksmith demonstrations and live music. Guest artist is clay sculptor Aissaree Seemann (Gam) from Gomalamadingdong. Kelly Riley & The Range Benders playing an amazing set of Americana, Blues & Folk with attitude. Featuring originals, traditionals and a few surprises. 113 NW Minnesota Ave., 541-306-3162, www.thefeathersedge.com. Featuring Bend artist Caroline Cornell showing her dreamy paintings of local landscapes and bird images. Local artist Euijin Esther Gray has designed a window installation in celebration BendFilm and First Friday. 845 NW Wall St., 541-317-3568. Artist Nathan Gray window display for BendFilm 10 year anniversary. Art of Taylor Rose and local musician Matt Lauziere on acoustic guitar and vocals. Local dance students will also perform “surprise dance moments” throughout the evening. Serving complementary kombucha from Kombucha Mama, wine and snacks, and raffling off FREE visits with the center’s practitioners. Rose began her artistic career in the forests of New Hampshire. While most of her art is pen and ink, she also uses some digital media. Her images are so warm and inviting you’ll wish you could walk right into the scenes. She’s often inspired by cartoons both animated and in print. Bend local, Matt Lauziere, will be performing his soul-stirring and thought provoking blend of folk and indie music. Local dance students, Bella and Zyla, will also perform surprise “dance moments” throughout the evening. 903 NW Wall St., 541-383-0050. Featuring a local artist window display for BendFilm 10 year anniversary. 118 NW Minnesota Ave. 925-389-0610, www.jeffreymurrayphotography.com. Landscape photography by Bend photographer Jeffrey Murray, from local and national locations. 1006 NW Bond St., www.johnpauldesigns.com. Specializing in unique, one of a kind wedding and engagement rings in a variety of metals and window display for BendFilm 10 year anniversary with John & Amy Castaño. 25 NW Minnesota Ave., Ste. 5, 541-388-0155, www.karenbandy.com. Tucked between Thump coffee and Alleda Real Estate, Karen Bandy is not easy to find, but well worth the effort. This month featuring Field Guide and Cocktail Earrings. Karen is Central Oregon’s only national/international award-winning jewelry designer and has been specializing in custom design in downtown Bend since 1987. Her designs are bold, fun and always very wearable. Karen Bandy is also an abstract acrylic painter whose work can best be described as colorful and textural contemporary fine art. When there is an actual subject, horses and wild animals are often depicted. Open Tuesday, Wednesday and Thursday, 11:30-5pm and by appointment, and First Fridays 5-9pm. Old Mill District, second story loft, 541-330-0840, www.lubbesmeyer.com. The Lubbesmeyer twins offer a range of work created in fiber and paint. Through the twins’ collaborative process, they distill literal imagery into vivid blocks of color and texture, creating an abstracted view of their surroundings. The working studio and gallery is open Tuesday thru Saturday, and the Lubbesmeyers welcome your visit. Upcycled Fashion Popup at Lubbesmeyer Studio & Gallery. The one-day found art and fashion event, featuring the latest Castaways clothing and jewelry by Myrna Massey Brooks, will be Saturday, October 26, 2–6pm. Her work is inspired by her sense of place and nature. She searches for the materials for her mixed media art pieces in the desert, scavenging weathered materials that embody the essence of time passed. These materials are crafted into sculptural totemic pieces that suggest the history of those materials. Castaways handcrafted one-of-a-kind fashions are made from knit castoffs that have been meticulously deconstructed then revamped into completely original, affordably priced wearable art. 150 Minnesota Ave. in downtown Bend. Featuring local artists Linda Lee Miller and Su Skjersaa Lukinbeal thru December. Art representing women’s lives, fashions and their inner and outer experiences will be represented in abstract and impressionistic mixed media images. This art exhibit will change monthly with thematic variations. Miller and Skjersaa Lukinbeal showcase several paintings focusing on water, the mythological symbol of woman and the recognition of its elemental, vital nature. Artist Leah Cassidy window display for BendFilm 10 year anniversary. 25 NW Minnesota Ave., Ste. 12 (above Thump Coffee), 408-250-2732, www.marymedrano.com. Mary Medrano is a full-time artist living and working in Bend with a studio downtown overlooking Tin Pan Alley. She makes pet portraits and expressive animal paintings. 869 NW Wall St., 541-388-2107, www.mockingbird-gallery.com. Listen to the jazz stylings of Rich Hurdle and Friends and enjoy an evening of sensational art. Dan Chen and William Pickerd will be collaborating once again for their show titled Shapes. These two Eugene area artists are joining a turned alabaster vessel with a cast bronze Calla Lily finial. William will unveil one of his latest creative endeavors which will include a vessel trimmed with a miniature Pueblo village made from semi-precious stones of many colors. When Chinese artist Chen immigrated to the United States in 1984, he brought years of artistic skills from his mentorships with master artists. His solid foundation in many art forms has allowed him to perfect his own particular methods. His art is a marriage of the finest qualities of eastern and western artistic approaches. Pickerd is a sculptor who uses a lathe to transform chunks of alabaster and wood into vessel shapes. The translucent stone responds well to tools and yields a form that can be both earthy and elegant. The material offers an infinite range of colors and patterns. William orders hundreds of pounds of alabaster from Volterra, Italy, and from digs in Colorado and Southern Utah. The vessels are turned very thin to expose the wonderful translucency of the natural material. The bowls are rimmed in exotic woods such as African Blackwood, Bloodwood and Purple Heart. 800 NW Wall St., 541-312-8566. Artist Lisa Sipe window display for BendFilm 10 year anniversary. The Oxford Hotel, 10 NW Minnesota. 869 NW Wall St., Ste. 104, 541-330-6000, www.paulscottfineart.com. New works by local artist Donald Yatomi thru October 29. Donald is an oil painter whose paintings know no boundaries in their subject matters or the hints of commentary they subtlety suggest about modern life in our cities. Featuring Brad Goldpaint’s landscape astrophotography ranging from fine art imagery of high altitude wilderness areas to time-lapse videos of the night sky. 926 NE Greenwood Ave. 541-728-0527. The featured quilter will be Jan Tetzlaff and the group exhibit will be the Undercover Quilters with quilts from the novel The Language of Flowers. Thru October. 103 NW Oregon Ave., 541-306-3176, www.redchairgallerybend.com. Nature as Art features Annie Dyer, Ian Herdell, Laura Childers and Lise Hoffman-McCabe. Dyer’s pottery must be looked at twice to be sure if it is rock or is it wood? That is Dyer’s intention as she gracefully blends texture and rich color to create elaborate pieces from amorphous white clay. Upon closer inspection the material becomes more evident but continues to invite further confirmation through touch. Ian Herdell and Laura Childers are the husband and wife team that comprise the custom woodshop know as Sierra Woodcraft, which brings you sustainably made, one of a kind woodwork. For each project, they strive to use as much reclaimed and sustainably sourced wood as possible. Each piece of wood is carefully selected for beautiful grain or unique features, hand milled and naturally cured outdoors. Lise Hoffman-McCabe is an award winning plein air pastel artist. Her paintings show the viewer her vision of the beauty that is Central Oregon and the Pacific Northwest. Red Chair artists will be constructing a window display for BendFilm’s 10 year anniverasary. 910 NW Harriman St., 541-312-2279. 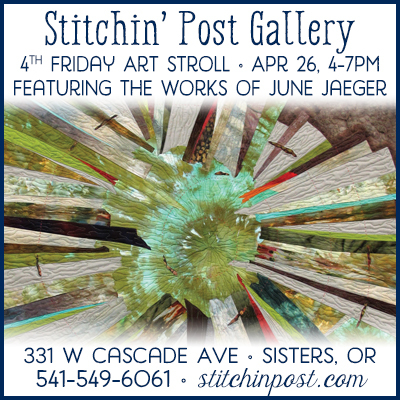 834 NW Brooks St., 541-382-5884, www.sageframing-gallery.com. A selection of paintings done by the Plein Air Painters of Oregon. This group also known as PAPO for short, was established here in Central Oregon in 2002, by local artists wishing to share their love of painting out-of-doors. Plein air, the art of representing observed effects of outdoor light and atmosphere on the spot can be quite challenging. The magical light and mood one finds compelling to paint, may only last a few moments. In addition, sun, wind, rain, snow and a host of insects can add to the challenge. Landscapes from many familiar local spots will be displayed as well as scenes from all over the state. Members use a wide variety of mediums and styles of painting. PAPO meets for frequent paint-outs during the warmer months of the year. 1001 Wall St., 541-322-8792, www.silveradogallery.com. Joseph Christensen of JC Lapidary. Oregon artist handcrafting beautiful jewelry featuring many stones from the Northwest. 706 SW Industrial Way, Ste. 100, Bend. 541-241-7818. www.thesilverotter.com. Exhibiting a collection of locally made art and handmade crafts from all over the world. Landscape photographer Stuart L. Gordon will be exhibiting prints of his recent images taken in British Columbia, Oregon and the Eastern Sierra Nevada thru November. Gordon, who has participated in many exhibits and First Friday ArtWalks in Central Oregon, travels extensively throughout the western United States in search of stunning landscape subjects for his camera. All the matted and framed prints in the Strictly Organic exhibit are made with archival inks and will be on sale thru November. The prints are available in a variety of sizes, both framed and unframed at his website: www.chasingthelight.zenfolio.com. Included in the exhibit are two award-winning images, First Snow and Sunset Light on McWay Falls. The first image, taken on a November morning at Sparks Lake, Oregon, was selected one of a dozen photographs singled out for praise in a worldwide competition judged by celebrated nature pho­tographer Art Wolfe in 2013. The second image, taken along the Big Sur coast, was a winner in a 2012 photography contest sponsored by the PhotoShelter web-hosting site. A dozen of Gordon’s work images were selected in 2013 as part of a digital gallery exhibit celebrat­ing Oregon sponsored by Photolucida, a non-profit national organization that promotes the art of pho­tography. In November, Gordon’s work will be part of a collective exhibit at Agora Gallery in New York City’s Chelsea District. Gordon also produces an annual calendar of Central Oregon images, sales of which benefits the Environmental Center. Caldera exhibit 2011-13 AiR Alumni who were The Ford Family Foundation Golden Spot Awardees. Thru October. A diversity of mediums, creativity and thinking will be on display by artists from Oregon. They include: Ryan LaBar, sculpture, Enterprise; Crystal Schenk, sculpture, Portland; Craig Goodworth, mixed media, Portland; Jeff Leake, painting, Portland; Roger Peet, printmaking, Portland; Terry Gloeckler, mixed media, Bend; Andy Myers, drawing, Corvallis; Cynthia Lahti, sculpture, drawing and painting, Portland; Christine Bourdette, drawing, Portland; Whitney Nye, mixed media, Portland and Shelby Davis, sculpture, Portland. The opening will celebrate the artists along with Caldera’s recent award of its second Golden Spot grant from The Ford Family Foundation including $40,000 for 2013–15. $20,000 of the grant will be awarded to Oregon visual artists who are accepted as residents to Caldera. 835 NW Wall St., 541-317-0700. 835 NW Bond St., Bend, 541-312-2001. Old Mill District, 450 SW Powerhouse Dr. Ste. 407, 541-385-9144, www.tumaloartco.com. Mother daughter artists, Carlie Leagjeld and Tracy Leagjeld, present their views of the world in different mediums and sensibilities. A lifetime Bend resident recently relocated to Portland, Tracy is a printmaker working in monotype. Using rollers and oil-based inks she creates layered, subtly textured landscapes as well as architectural forms and seascapes with surfers. “I am not as much concerned with capturing correct shape and color, as striving to create images that allow the viewer to put themselves into the painting and feel the spirit of the place,” says Tracy. Carlie, who grew up in Bend, developed the idea of brushing paint on glass then peeling off the paint and transferring the pieces to waxed paper in graduate school at American University in Washington DC. Arranging the paint pieces on board or paper, layers some for a three-dimensional effect and places others into patterns that suggest leaves, vines or other organic materials. Some arrangements seem to be variegated planets or moons. Artist KP uses ink- mainly sharpie- to create portraits of iconic artists in American culture. She draws abstract images, mostly of trees. Her main source of canvas is drywall. Dj JBryan Barisone of Portland will provide music at First Friday. Kevin Prather, Random Presents, 541-228-2568.